The Kevin Chevell Background Story - I originally established a fitness centre in Penrith, new south wales in April 1983, which continues to this day. Recalling the 1980's, I became disillusioned by the alarming numbers of people that dropped out of exercise within just three short months from getting started on their fitness routine. Within the fitness industry this is commonplace. People so often join gyms or take up regular exercise in the hope of losing weight and becoming fit and toned. Then within three months at least 85% are no longer exercising regularly. To explain why so many drop out so soon varies in reasons, but by far the most common reply is they haven't achieved enough meaningful results. Put simply, they lose motivation because after spending/attending some kind of exercise for an hour a day three times a week, they have little to show for it. And of course they are going to drop out. Why would they stay? Give me one good reason? One good way of measuring whether your methods work is to find out how long you can keep a customer. For the past many years, we maintain our members on average 22 months before they decide to cancel. The average within this industry is 12-14 months, and for the most part they are paying but not using their membership. It would be different if the members were achieving all and more than they expect from they're exercise routines. This is why I have emphasised teaching and following the Chevell methods to fitness, rather than the conventional routines centred around 40-60 minutes, three times a week. In 1991, I decided to focus on strength and conditioning professional cricketers at a state and international level, and NRL rugby league players. My methods worked over and over. There were stages during the nineties and early 2000's, that I had a who's who stable of well known sports legends out here in Penrith under my guidance, and all after the same thing - an edge on their opposition. Every single sportsperson I have worked with has either become sportsmen of the year, Australian of the year, became an all-time outstanding performance in their sport, or been voted player of the year since spending an off season training with me. I have brought out their best even at their peak, or I have brought them back from the depths to produce their career best performances, after form slumps or prolonged career ending injury. In the mid 1990's I scaled my methods to suit the average person. And still it works. If you are older, I can get you going. If you've got a new heart, I can get you going. If you're too busy to exercise, I can still get you going. And if you're a youngster, and you are the future of our country, I can give you lessons in fitness you will remember as you go through life. In 2007 Glenn McGrath retired from a long and distinguished career as one of Australia's cricketing all-time greats. The most humbling of experiences occurred for me when Glenn McGrath presented me with his esteemed "baggy green" cap as an expression of gratitude for my help, and a mark of our friendship. It's a long road to discover what really works. You can go only so far with what you've read, and only so far with the science. This kind of knowledge will give you a start, but what you really need is the lift. Fitness coaching/fitness training is an art even more than it is a science. An art that thankfully I have mastered. I use this art everyday at Kevin Chevell's Inside Fitness, have done so for over 27 years here in Penrith. I have an understudy to assist me. He has been with me over ten years now, and he might even be better than me. His name - Nigel Wright. 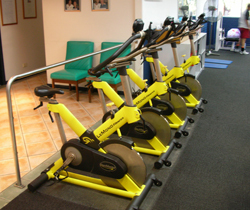 The two of us are a formidable team of exercise experts to help you out. Nigel is a fitness "tragic". He is an ex-international rugby league footballer having represented his country on many occasions. After 15 years as a professional sportsperson, and having been exposed to the supposed best fitness training protocols, Nigel admits that had he known of the Chevell system to fitness training, that his own career would have reached even greater highs and sustained over many years longer. So, all this talk about sports stars but they need exercise to earn their living, but what about me? This is where the experience comes in. 95% of our help and guidance goes to you. You might be a busy Mum, you might be doing your HSC, you might be getting over an operation and need to get the soreness out, you might even be curious about exercise for seniors and can it really help older folk. Yes it can for all the above, come in and say hello. It won't cost you a cent to ask your questions to me personally, and it costs me nothing to talk to you.